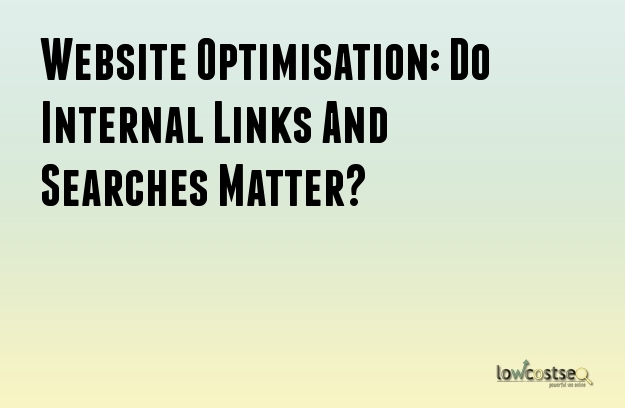 Website Optimisation: Do Internal Links And Searches Matter? When it comes to getting the most out of the web, any SEO agency will naturally put its efforts into link building, with a reasonable amount of on-page website optimisation as well. However, there are a few things that often get ignored as a result. Specifically, when it comes to on-page developments, agencies strive to ensure pages catch keywords, display content clearly and offer the reader a valuable experience. What they often don’t do is consider their navigation, searching and linking opportunities. So, let’s see just how and why these areas matter. The most basic assumption of SEO is that external, do-follow links are important, while few else are. Yet, in all actuality, no-follow links have a purpose. Likewise, your internal links serve a purpose, even if it’s not helping improve your visibility on search engines. First of all, such links help navigation, as users can quickly link to relevant pages, if interested. Threading links throughout the site also establishes the website hierarchy, as pages are connected more and more deeply. Yet, while there are many benefits to internal links, the best is to use them to link to deeper, niche pages. When Google crawls internal links, these links tell the bots these pages are important. Your landing pages and home page are likely already established (after all, Google is in the middle of crawling your website), so these links ensure the most important and relevant niche pages don’t get ignored, either. If a user wants a specific product or piece of information, a well optimised site will naturally show up in search results with the right page. However, this is often for long-tail keywords. Outside of this, people are most often drawn to a small handful of landing pages, often relying on internal navigation to move any deeper. There are many ways to quantify internal search behaviour and doing so can help identify any weak flaws. If a user can’t find what they’re looking for because of an ineffective internal search, they can often assume such products, information or content just isn’t available on your site. This, in turn, can lead them to go elsewhere. One of the most common metrics is the click through rate, or CTR. People are already on your site, so it’s not an issue of visibility (you’re only competing with yourself). If users quickly see the content that fits their query – through a clear heading, for instance – this will often lead to a higher CTR. You can use this data to find the queries that are failing. Either you don’t have a dedicated page – in which case, you should consider adding it – or its not matching with these searchable keywords. Ultimately, many will argue this isn’t as important as SEO, yet it often follows after your SEO efforts. If you’re getting people to your website, you should be doing everything possible to keep them there. Good internal links and search capabilities go hand in hand with good internal content and website design. It’s something that is easy to implement but, if you overlook it, can give you a strong disadvantage.